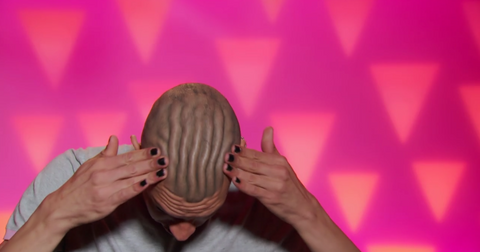 Last week wasn't the first time we watched Yvie Oddly push herself too hard on RuPaul's Drag Race. The self-described "oddball of RuPaul's Drag Race Season 11" has managed to wow judges and Ru week after week with her humor and dedication. But a few weeks ago, during "Trump: The Rusical," audiences first began to notice that Yvie, 24, was extra nervous when it came time for the group choreography. We watched as her knees rolled to the side while she admitted to the dance instructor and the rest of the group, "I'm just a little worried about hitting my knees because they come out of place a lot. It's part of my disease I've got, girl," Yvie explained. "All of my s--t pops out." And last week, we saw the down-to-earth queen injure her ankle again during the "Draglympics." So, what's Yvie Oddly's condition? "I have a connective tissue disorder where all of my joints are, while they're flexible, all of it pops out of place if I hit the ground too hard," Yvie revealed back in Episode 4, "so I'm going to try and be soft." We are obsessed with her incredible attitude — despite the pain she endures on a daily basis and the fear of having her joints slip out of place. She's low-key one of the most grounded contestants Ru Paul's Drag Race has seen in years. 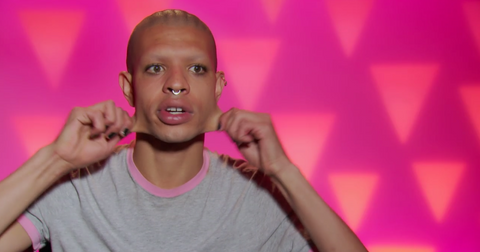 In a confessional interview, Yvie later explained to cameras that her condition is called Ehler-Danlos syndrome type 3. "I don't produce a whole lot of collagen so I have extra skin like everywhere," she demonstrated by squishing the skin on her scalp and stretching the skin around her face. "And I'm prone to dislocating my knees and things like that, but it's not going to hold me back in this competition." Despite her condition — which the Mayo Clinic describes as "a group of inherited disorders that affect your connective tissues" — Yvie always keeps her chin high. And she's not backing down. Even after she twisted her ankle last week and had to wobble around with an adorable ice pack, she continued to give the competition her all. "If I have to go out on stage in a wheelchair, girl, I'll do it," she asserts, resiliently. Twisting ankles, fragile skin, and overly flexible joints seems par for the course for people who have Ehlers-Danlos syndrome. Mayo Clinic notes that the condition can pose a problem if a patient ever has a wound, because "the skin often isn't strong enough" to hold stitches. Likewise, the most common symptoms of Ehler-Danlos syndrome are joint hypermobility, skin hyperextensibility, and tissue fragility. In a recent interview with Out, Yvie admitted that she never wanted to bring up her disease on the show. "I really badly didn't want to bring up my disease," she admitted. "Maybe it's just because I'm hyper competitive but I didn't want to make it clear that I had any sort of weakness holding me back. 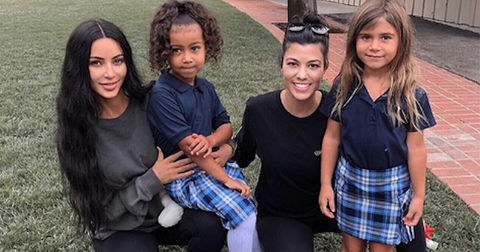 Drag in general is a lot of pain, a lot of sweat, blood, and tears and I didn't feel like bringing it up would paint me in a good way with my sisters." We're honestly in awe of Yvie and her attitude. We love that we're finally getting to see her backstory, her struggles and how she still manages to persist as the baddest queen of the whole crew. "Every year," she continued, "I lose another set of skills that came easy for me the year prior." "I know eventually I'm either going to have to stop doing all of my crazy exhaustive acrobatic performances or I'm going to...I just know that I'm going to have to stop," she said. 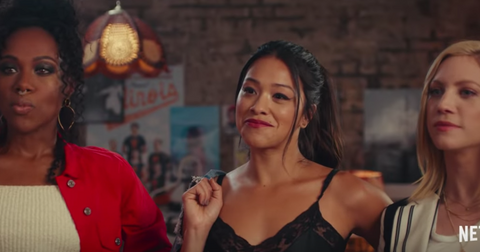 We're so glad we're getting to see her incredible moves before that day comes and will continue cheering Yvie on through the end of the season. RuPaul's Drag Race airs Thursdays at 9 p.m. on VH1.